K S ELECTROMECH introduces Flying Cold Saw for High Speed Tube Mills. Operational ease, low maintenance & energy efficiency give a unique edge to the K.S. 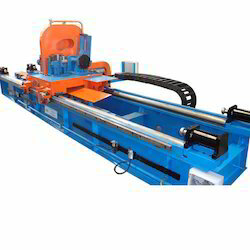 Electromech Private Limited’s cold saw. It has various advantages over a traditional Friction Saw. FEATURES :Burr Free Square Cutting suitable for Round/Shaped profiles.Max Line Speed: 120 m/min.Suitable for CR/HR Carbon Steel.Integrated accelerator with high mechanical efficiency.Complete Protection from Chips Contamination.Rapid Blade changing mechanism.Ball screw & slides for low maintenance. Looking for Flying Cold Saw Cutoff ?